EQUAZEN uses a unique marine fish oil that has four times more EPA than DHA. This allows the EPA to function better, and give it a more active role in helping to maintain the eye and brain in healthy functioning order. EQUAZEN contains high quality marine and botanical oils. Here are a few of the key facts that you may want to know so that you – or your children – can take these oils with confidence. In EQUAZEN, the high EPA marine oil comes from small fish, specifically sardines and pilchards. The fish which is used in these oils is sourced from sustainable stocks. The oil used is independently tested for its Vitamin A and D content. For the high EPA oils, the harvest of the fish is during the few weeks of the year when these oils are highest, ensuring that the oils deliver a high natural source of EPA – this is important for the quality of this fish oil. The oils comply with stringent EC and WHO regulations with regard to dioxins, PCBs, heavy metals and other potential pollutants. It can be hard to get children to take supplements, especially fish oil. That’s where Equazen eye q liquid comes in! We only use naturally sourced oils in our two Equazen eye q liquid formulations. Firstly, our high EPA (eicosapentaenoic acid) marine lipid is processed to remove much of the fishy taste and odour. Great for kids! We then combine the fish oil with virgin EPO (evening primrose oil). Children will love Equazen eye q liquid’s vanilla flavour too. Extracted from Madagascan vanilla beans, we employ the latest flavouring technology developed for the luxury ice cream industry, but without the sugar! Our citrus flavour is a blend of natural lemon flavours. Also great for those who find it difficult to swallow capsules, we advise one teaspoon of Equazen eye q liquid per day. If you are starting supplementation after a long break or for the first time, we suggest a daily intake of three teaspoons for the first twelve weeks, in order to build up the body’s levels of Essential Fatty Acids. Once opened, refrigerate and consume within three months. Chilled oil may look cloudy. Hi-EPA fish oil, Evening Primrose Oil, Natural Vitamin E (as d-alpha tocopherol, from IP soya). 3 EU recommended daily allowance: 108% RDA. +∞TE = d-alpha tocopherol. Making the most of the Equazen eye q range. Research suggests that it can take up to three months for the long chain essential fatty acids to be effectively utilised by our bodies. Therefore our supplementation plan is based on an initial loading of the essential fatty acids for the first three months. After that period the intake can be reduced to a lower maintenance level. We recommend the same intake levels for children over the age of three as for adults. They may be smaller in frame but the brain is close to its full size and therefore children are able to absorb the same amount of essential fatty acids. It can be hard to get children to take essential fatty acids, especially fish oil. That's where Equazen eye q liquid comes in! If taking the liquid we recommend at least 1 x 5ml tsp for the maintenance intake and 3 x 5ml tsp for the initial 12 week intake. For children between the age of two and five, it's best to start off on 1 x 5 ml tsp a day for the first week, just to see if they can tolerate the oils. Do not exceed the recommended daily intake. Once opened, refrigerate and consume within three months. Chilled oil may look cloudy. Avoid exposing the oil to oxygen, by keeping the bottle sealed wherever possible. Do not cook with the oil. Equazen eye q contains high quality marine and botanical oils. Here are a few of the key facts that you may want to know so that you – or your children – can take our oils with confidence. 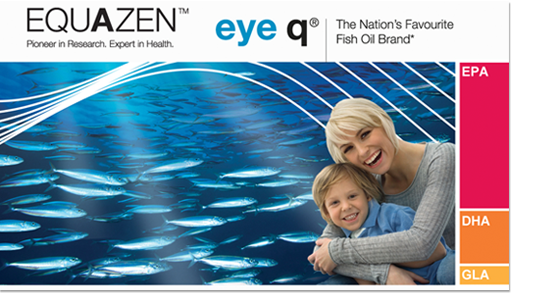 In equazen eye q, the high EPA marine oil comes from small fish, specifically sardines and pilchards. The fish which we use in our oils is sourced from sustainable stocks. The oil we use is independently tested for its Vitamin A and D content. For our high EPA oils, we harvest the fish during the few weeks of the year when these oils are highest, ensuring that we deliver a high natural source of EPA – this is important for the quality of our fish oil. We comply with stringent EC and WHO regulations with regard to dioxins, PCBs, heavy metals and other potential pollutants. The result is high quality fish oil in a natural form. Extract with a simple mechanical press similar to that used for virgin olive oil, ensuring minimal contact with heat, light or oxygen. We believe this to be superior to the other methods. Solvent extraction leaves chemical traces, and mainstream pressing causes heat damage to this delicate oil. Filter the oil to take out small particles. Finally, when manufacturing these ingredients, we use pharmaceutical-grade facilities for encapsulation and packaging. If taking Eye Q liquid the initial dosage is 3 x 5ml teaspoons a day, followed by a 1 x 5ml teaspoon maintenance dosage. These levels of consumption reflect numerous studies which show that it can take up to about 12 weeks to build up the body's stores of long chain fatty acids. After this time, you can reduce the intake to the maintenance level. Intake can be increased at any time to meet individual needs. These intakes are suitable for use by both adults and children. Shake bottle before using. Refrigerate after opening. Use within 3 months. Chilled oil may look cloudy. The incidence of side effects associated with the use of Equazen eye q is rare. However, we would suggest that if a person intending to supplement has any medical condition, known allergy, or is on any medication, or if there are any other concerns, that your GP is consulted before taking the product. All the oils in Equazen eye q have been independently tested to ensure compliance with EU and WHO rules on purity. In some rare instances, taking the oils can cause nausea and loose stools, indicating that the body may be still adjusting to this new dietary input. If this happens, stop supplementation until the symptoms finish. Then you can start again, making sure that you take the supplement with meals.